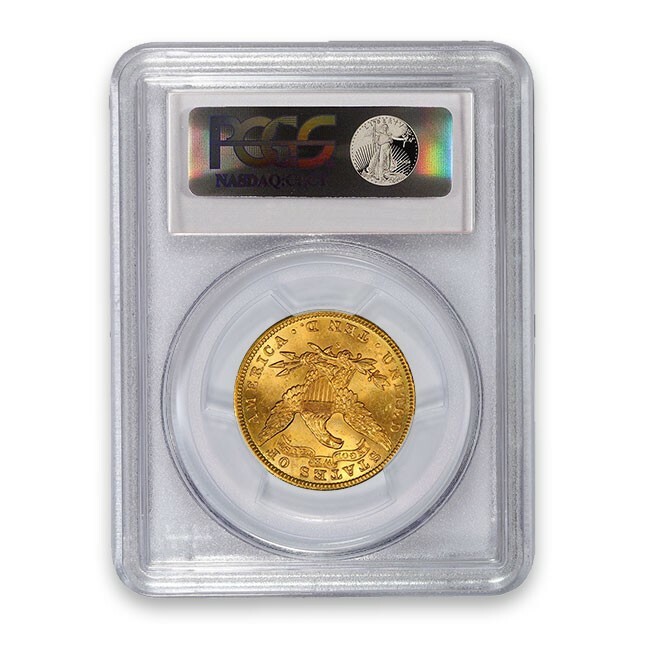 The $10 gold eagle was the longest-lived of America’s circulating gold coins. It was first struck in 1795 and was produced regularly until 1933, when Franklin D. Roosevelt abolished gold coinage altogether. Not only was the $10 eagle the longest-running gold denomination, but the $10 Liberty design was used for nearly 70 years. Remarkably, this motif remained in place without major modification from 1838 through 1907. 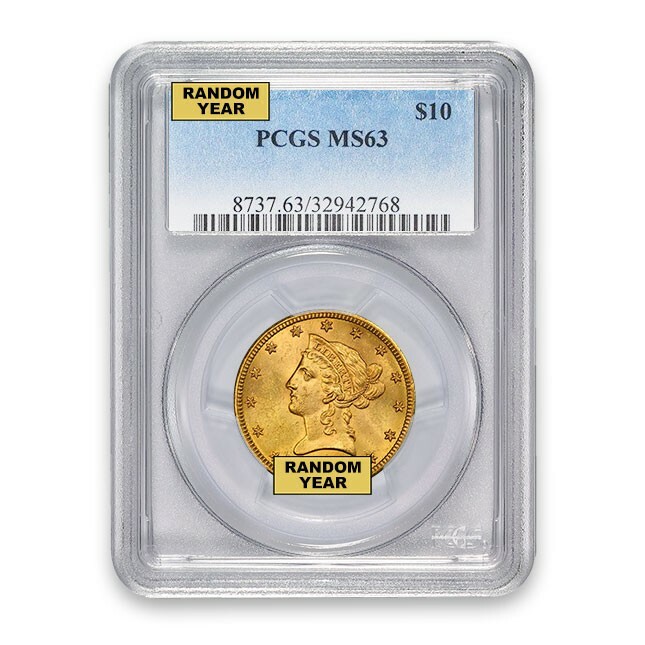 The very first $10 gold eagles were struck in 1795. Producing gold coinage was a landmark achievement for the United States; it was a sign of status and advancement as a nation. Established countries like Great Britain, France and Brazil were already issuing gold pieces—and the US was eager to join that club. Unfortunately America’s gold coinage was initially rejected in international commerce. Merchants preferred to use familiar coins like French 24 Livres or Brazilian 4000 Reis over these new American pieces. As a result, demand and mintages remained very low. Finally, in 1804, the United States Mint decided to temporarily discontinue the $10 eagle. The smaller $5 half eagle was closer in size to the world’s most recognized and popular gold coins—and as a result it found some acceptance domestically and abroad. The $10 eagle, meanwhile, was largely rejected worldwide. American gold coins would face another issue in the 1810s and 1820s. As gold spiked during the Napoleonic Wars, US gold coins had greater melt value than face value. An arbitrage play developed; US gold coins could be bought at face in the states and melted in Europe for a profit. As world conditions stabilized in the late 1830s, the United States revisited the $10 eagle. It was brought back in 1838 with a design engraved by Christian Gobrecht. The portrait of Liberty on the obverse was inspired by the portrait of Venus in Benjamin West’s painting Omnia Vincit Amor (Love Conquers All). The motif was extremely well-received and later adopted for the half eagle in 1839 and the quarter eagle in 1840. A testament to the design’s popularity is the fact that it remained in place until the 20th century. Numismatists refer to this design as the “Coronet Series” or, more frequently, the “Liberty” series. The best way to describe $10 Liberty production levels is inconsistent. The denomination was in constant competition with the $20 double eagle—and eventually the latter prevailed as the coin of choice. From 1881-1882, for example, the Philadelphia Mint struck over 6,000,000 $10 eagles. By comparison, that same year, it only struck 2,770 double eagles! The tides would later turn in years like 1889, where Philadelphia released just 4,440 $10 eagles and ten times as many $20 double eagles. As time went on, the double eagle won the “mintage war” just about every year. The $10 Liberty was finally discontinued in 1907, when it was phased out in favor of the $10 Indian. President Theodore Roosevelt felt—and with good reason—that the $10 Liberty design had become stale and was in dire need of a redesign. Indeed, the motif was largely untouched for nearly 70 years and, to many citizens and critics, had become long in the tooth. The decades-old Liberty design would vanish from the $2.50, $5 and $20 in 1907 and then the $5 in 1908. Best Price On $10 Liberties!